When a sitting U.S. senator up for reelection asks that neither the press nor the public be allowed to attend a debate with her opponent, that kind of thing tends to generate attention. Sen. Cindy Hyde-Smith (R-Miss. ), who is trying to hold on to her seat in a runoff against Democratic challenger Mike Espy, faced an onslaught of criticism after the Jackson Free Press revealed her lengthy list of demands for Tuesday night’s debate. She won that battle—according to the paper, just “the debate moderator, panelists, and the production team will be allowed in the auditorium”—but those weren’t her only requests that were granted. A notepad was going to be at the podium for candidates when they stepped onto the stage at the start of the debate, but the Hyde-Smith team wanted the notepad sooner. The candidates will instead be given notepads about an hour before the debate begins. Hyde-Smith’s team originally asked that she be allowed to bring in “a binder” but was denied, the source said. “They have restricted this debate so much that if she bombs, it will be a miracle,” the source said. At one point in tonight’s debate, the candidates were going to be given the chance to directly ask one another a question. 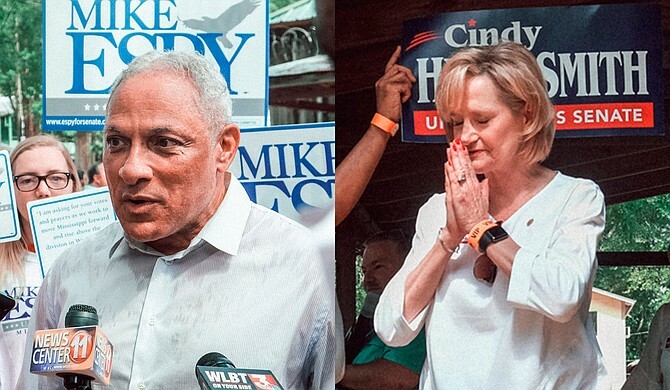 The Hyde-Smith campaign, however, did not like that idea. Instead, they asked to submit the question ahead of time and for the moderator to ask the questions on the candidates’ behalfs. Posted by Libergirl who is from Mississippi and says send her lameness(she needed crib notes to debate) back home…come on black people VOTE send Mike to the Senate! Previous Previous post: Is the Air Coming Out of Housing Bubble 2.0?